Legal, recreational marijuana is on sale now in Fall River. And it may be a far cry from what you’d expect. 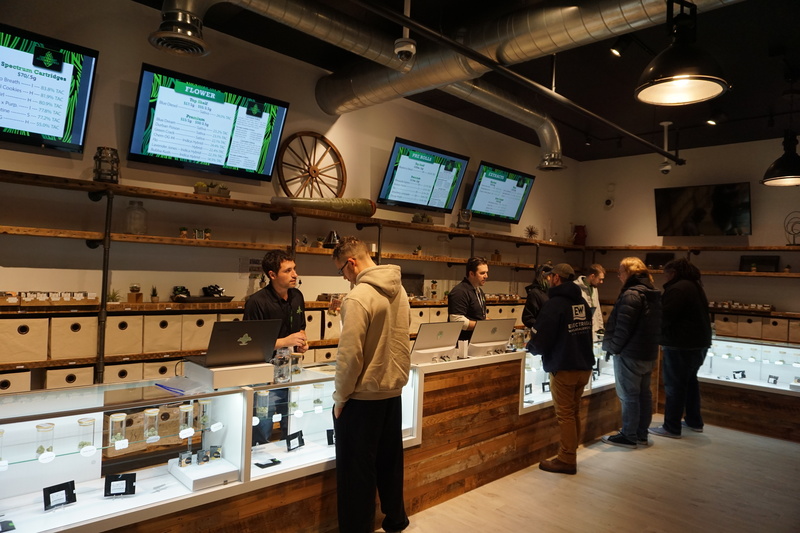 If you’ve ever purchased weed in your life, it probably didn’t involve a customer service, an ID check, or a mobile app to ping you when your order was ready. This is what selling weed looks like in 2019. 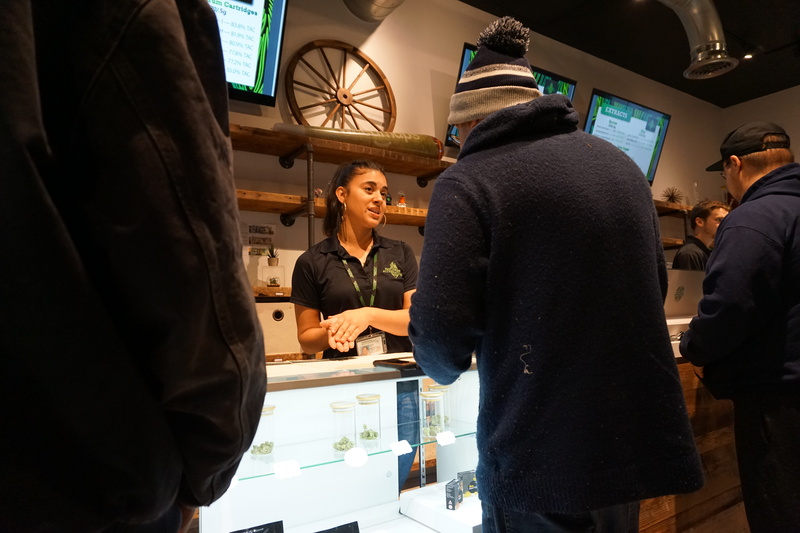 Beyond the front-door security at Northeast Alternatives, there’s a large room lined with counters, cash registers and plenty of pot. Plasma screens, hardwood counter tops and polo-shirted employees, give the shop an Apple Store vibe. Friendly staff offers guidance to customers. Do you like something that’s going to hit you hard or something that’s very mellow, they ask. For the uninitiated, it’s all a little confusing. There are more than 30 products for sale, and more on the way. Samples nest in little jars, for customers to smell. At each cash register, jars of coffee beans are available: nose palate cleansers. 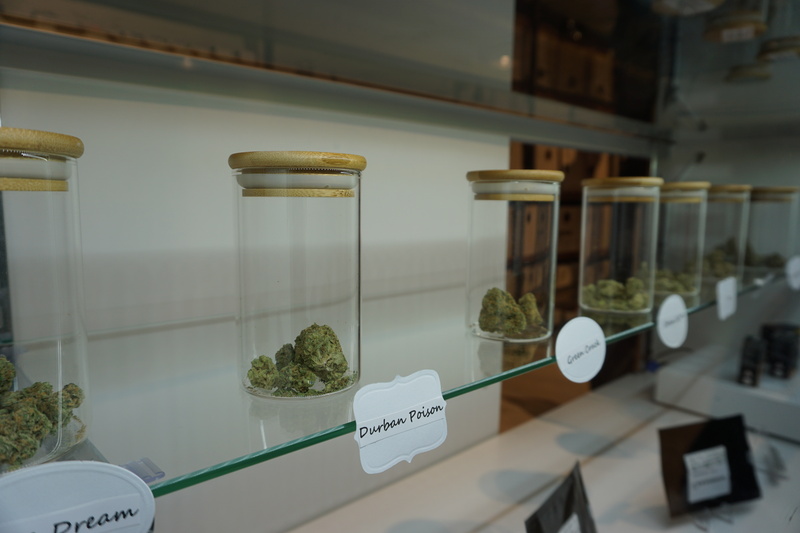 “We’ve got blue diesel, blue dream, durbin poison, green crack, chem OG #4, flo, lavender jones, and bubba kush,” Cera Bateman said pointing to the samples. She’s one about a dozen “bud-tenders” here. If you don’t get that joke maybe this isn’t a store you’ll be frequenting. She and her coworkers have probably one of the few jobs in existence where prior marijuana use is an expectation. That’s because they need to know the merchandise. 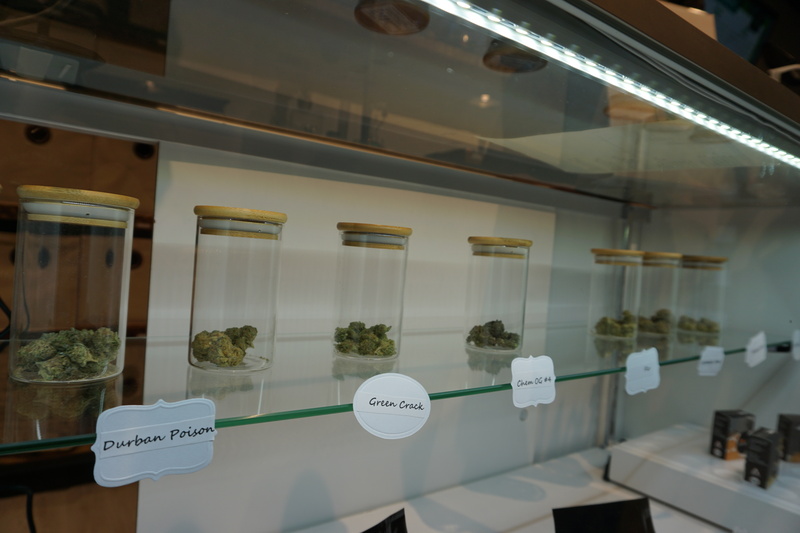 “There’s different strains,” Bateman said. “One that will get you up and going it will make you motivated to get up and go to the store. All this stuff, the menus, the uniforms, it all feels a little corporate, and that’s sort of the point said co-owner Rich Rosier. It’s an above board operation. “Much like alcohol for a period of time was banned in this country, you finally have this particular drug eliminated as illegal in certain states, first medical then for recreational,” Rosier said. But small details remind you that this operation is still far from buying a six pack, including the constant police presence and the eye-popping price tag. On opening weekend, a steady stream of customers walked through the doors. People are asked to give phone numbers upon entry. And if area codes or license plates in the parking lot are any indication, the store is already a big hit with Rhode Islanders. The location is just steps away from the Rhode Island border where recreational marijuana is still illegal. 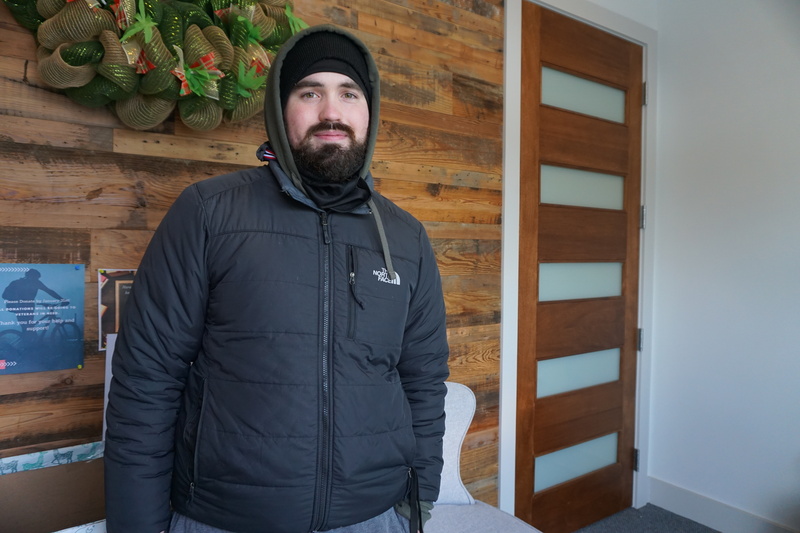 But Cusak says no matter what Rhode Island does as a state, its residents are already involved in Massachusetts pot economy. In fact he’s one of several employees who live in Rhode Island. “It’s not like it’s a million-dollar job, but people love it as a dream job,” Cusak said. It’s not a million-dollar job, but employees say starting pay here is about $16 per hour. Well above both Rhode Island and Massachusetts’ minimum wage. And Massachusetts expects to rake in at least $44-million dollars in revenue from pot sales this year. Standing in front of this busy, well-staffed company, it’s hard to imagine this as anything but inevitable. But this has been an about-face on marijuana for the region that surprised even Cusak. The question is whether Rhode Island will follow Massachusetts lead. It may. On this day, Fall River police just look on while customers file in and out of the store with up to an ounce of marijuana. But for now, if you’re caught with that pot in Rhode Island, you’re still going to get a fine. 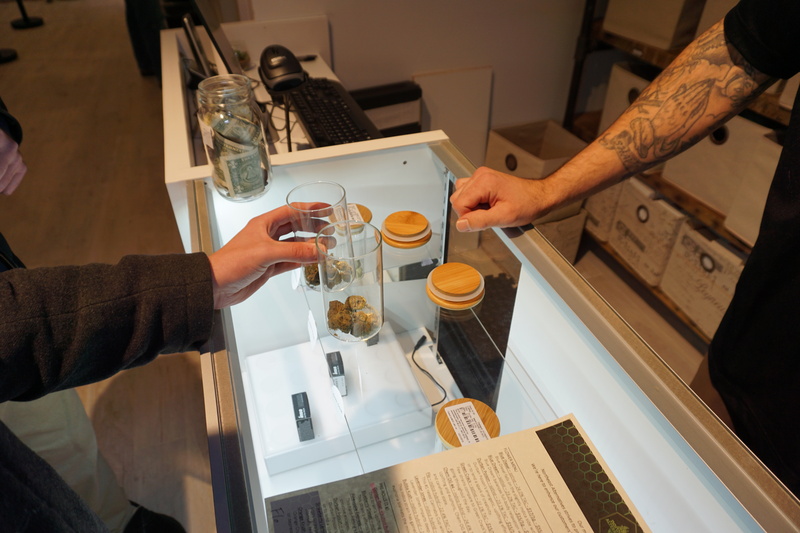 A customer smells samples with a 'bud tender' at Northeast Alternatives in Fall River.